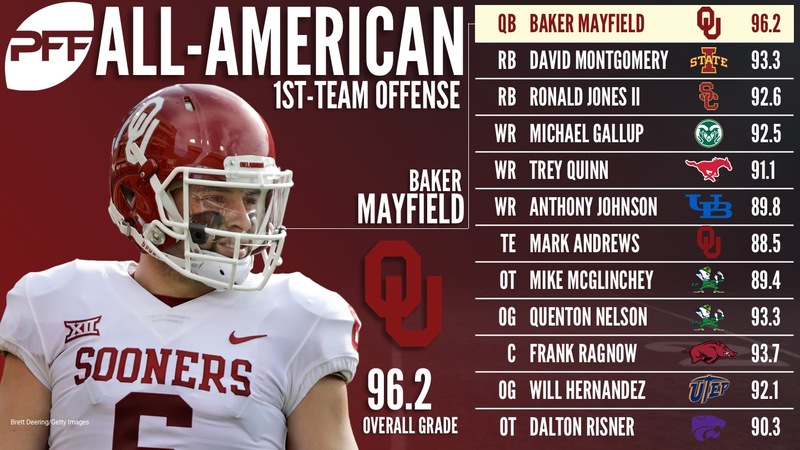 After grading and analyzing every snap of the college football season, it’s time to unveil the 2017 PFF All-American team. 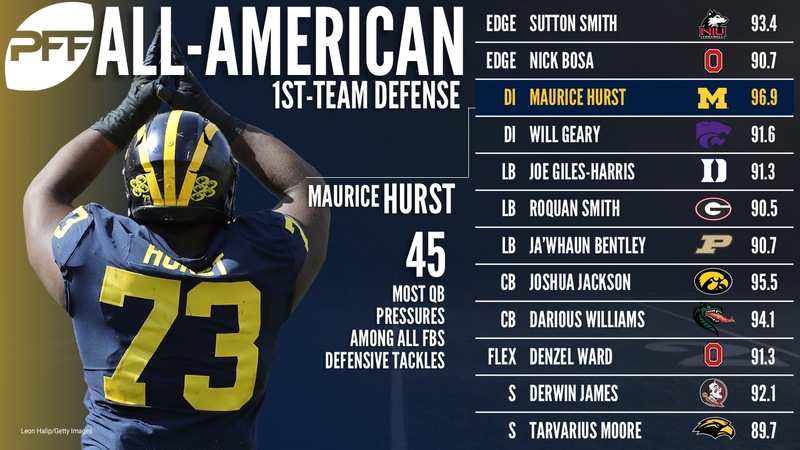 See below for first and second-team honors. The top-graded offensive player in the nation, Mayfield was dominant from start to finish this season. He can throw the ball to every level with accuracy and no matter what defenses throw at him, Mayfield has been equipped to pick them apart. He led the nation with an adjusted completion percentage of 82.6 percent while also leading the way with a passer rating of 134.8 on deep (20-plus yard) passes. While Montgomery didn’t light up the stat sheet like some of the nation’s other running backs, he was the most efficient runner outside of his offensive line. He set a PFF-era record (dating back to 2014) with 102 forced missed tackles (81 as a runner, 23 as a receiver), while averaging 3.5 yards after contact per rush. Jones also averaged 3.5 yards after contact per rush, and he added a big-play element to the USC offense with 6.3 yards per carry. Gallup and Johnson tied for eighth in the nation with 3.47 yards per route with Gallup ranking third in forced missed tackles with 20 while Johnson’s 579 yards on deep (20-plus yard) passes also ranked third in the nation. Quinn has been the nation’s most productive slot receiver on a per route basis, averaging 4.47 yards per route in the slot while dropping only two of his 108 catchable passes all season. Andrews is part tight end, part slot receiver, but regardless of name, he’s been the nation’s most efficient tight end with his 2.78 yards per route. His 907 receiving yards are almost 300 more than the next-closest at the position and he ranks third in the nation with eight forced missed tackles after the catch. McGlinchey makes the team on the back of a dominant performance as a run blocker where his 94.1 grade was far and away the nation’s top mark. Risner has had a well-rounded season, ranking sixth as a pass-blocker (89.7) and fourth in the run game (87.7) while allowing only three pressures all season. The left side of the Notre Dame offensive line was the stuff of legends as Nelson also led the nation with a 92.7 grade as run blocker while ranking fourth in pass protection at 89.3. Hernandez ranked second in both categories, reaching PFF first-team All-American status for the second straight year. He’s allowed only four hurries in two seasons. Ragnow also makes the team for the second straight year as he led all centers with a 92.4 grade in the run game to go with an 88.3 mark in pass protection. He allowed only one pressure on his 255 pass blocking snaps, and despite not playing since Week 8, his dominant performance was too much to pass up. No edge defender pressured the quarterback more than Smith who finished with a nation-high 73 pressures (15 sacks, 11 QB hits, and 47 hurries). He finished with the nation’s top grade as a pass-rusher (91.6) and against the run (90.1). Bosa’s per-snap production was off the charts as he finished with seven sacks, 11 QB hits, and 33 hurries on only 294 rushes and his 89.6 pass-rush grade led all Power-5 edge defenders. Giles-Harris finished with the No. 3 grade against the run at 92.3 while showing well in coverage at 84.6 and tying for sixth in the nation with 61 stops. Smith has been the heart and soul of Georgia’s playoff-caliber defense and he finished with the nation’s No. 3 grade in coverage (89.8) while ranking third with 65 total stops. Bentley has been the top run-stopping linebacker in the country at 94.6 while also breaking up two passes on only 28 targets. Jackson leads the nation in both interceptions (seven) and pass breakups (17) while allowing a passer rating of only 40.2 into his coverage. Williams allowed only 33.3 percent of passes to be completed into his coverage (best among corners with at least 50 targets) while ranking fourth with 13 pass breakups and allowing a passer rating of only 37.3. Ward gets the nod as the flex defender as just missing out at cornerback. He allowed only 36.2 percent of passes to be completed into his coverage (second) while his 12 pass breakups tied for fifth. Bouncing back nicely from injury, James returned to form to post the top grade for a safety in the country for the second time in three years. He finished with the No. 2 grade in both coverage at 90.3 and pass-rushing at 73.2 proving effective against the run at 85.1. Moore had a breakout year for Southern Miss, ranking second among safeties against the run (88.3) and seventh in coverage (87.8). Carson ranked third in the nation with four field goals of 50-plus yards, and he had the third-best grade on kickoffs as he booted 63 touchbacks on only 87 attempts. Dickson led the country with a net punting average of 44.2 and he tied for third with 32 punts landing inside the 20. With four kickoff returns for touchdowns and 40.9 yards per return, Pollard narrowly edges Green who finished with four touchdowns and a 32.9 average. Pettis returned an incredible four punts for scores on only 22 attempts while averaging 19.6 yards per return.